Echo 1 launched in August of 1960, finally allowing America to participate in the Space Race, which until then was roundly being won by the USSR. Electronics magazines of the day were filled with prognostications of the future of space communications. Electronics World dedicated most of their November issue to satellite Earth stations and advancements being made in ultra sensitive receivers and powerful transmitters. Since the earliest satellites were literally metallic balls for reflecting radio signals, it was necessary to optimize both ends of the communications path since there were no circuits onboard the satellite to perform signal processing and re-transmission. Bell Labs, of course, was at the forefront of the technology. In fact a famously serendipitous discovery was made by a couple scientists in 1964 using the very antenna featured in this advertisement. 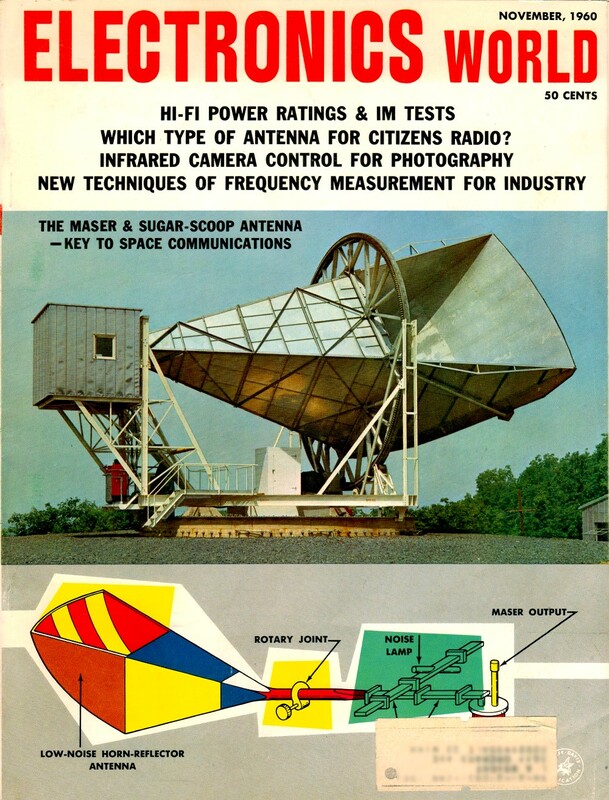 Articles here on RF Cafe which mention the Dr. Robert W. Wilson and Dr. Arno Penzias are The Maser & Sugar Scoop Antenna: Receiver for Signals from Space, Bell Telephone Laboratories Project Echo, The Amazing Maser: The Jewel That Conquers Space, Cosmic Radio Signals from Sun and Stars, and Sugar-Scoop Antenna. "Project Echo" satellite went into a near-perfect circular orbit 1000 miles high, circling the earth once every two hours. Its orbital path covered all parts of the U. S.
First Phone Call Via Man-Made Satellite! Think of watching a royal wedding in Europe by live TV, or telephoning to Singapore or Calcutta - by way of outer-space satellites! A mere dream a few years ago, this idea is now a giant step closer to reality. Bell Telephone Laboratories recently took the step by successfully bouncing a phone call between its Holmdel, N. J., test site and the Jet Propulsion Laboratory of the National Aeronautics and Space Administration (NASA) in Goldstone, California. The reflector was a 100-foot sphere of aluminized plastic orbiting the earth 1000 miles up. The Delta rocket which carried the satellite into space was steered into a precise orbit by the Bell Laboratories Command Guidance System. This is the same system which recently guided the remarkable Tiros I weather satellite into its near-perfect circular orbit. To pick up the signals, a special horn-reflector antenna was used. Previously perfected by Bell Laboratories for microwave radio relay, it is virtually immune to common radio "noise" interference. The amplifier - also a Laboratories development - was a traveling wave "maser" with very low noise susceptibility. The signals were still further protected from noise by a special FM receiving technique invented at Bell Laboratories. "Project Echo" foreshadows the day when numerous man-made satellites might be in orbit all around the earth, acting as 24-hour-a-day relay stations for TV programs and phone calls between all nations. 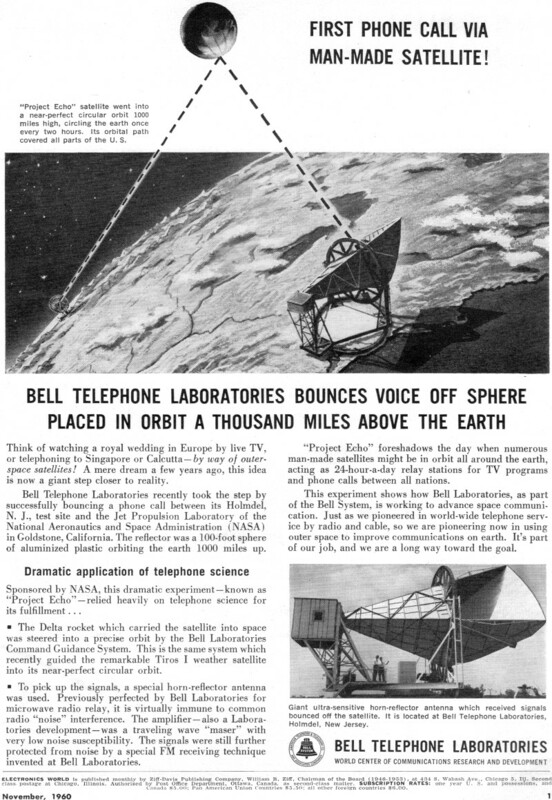 This experiment shows how Bell Laboratories, as part of the Bell System, is working to advance space communication. Just as we pioneered in worldwide telephone service by radio and cable, so we are pioneering now in using outer space to improve communications on earth. It's part of our job, and we are a long way toward the goal. Giant ultra-sensitive horn-reflector antenna which received signals bounced off the satellite. It is located at Bell Telephone Laboratories, Holmdel, New Jersey.